Attentil Benefits And Side Effects | Does Attentil Work? Attentil was a wonder drug when it was introduced in Europe as Fipexide in the 1980's, but newer, safer, more powerful drugs caused it to lose its relevancy over time. Despite all this, Attentil holds a place in history as one of the most influential nootropics of all time. Attentil (Fipexide Hydrochloride) was developed in Italy in the 1980's, and enjoyed a very successful release and run of popularity across Europe, especially in Italy and France, during this same decade. 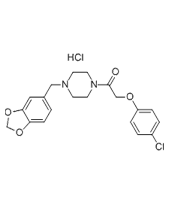 Attentil is a combination of parachlorophenoxyacetate and methylenedioxybenzyl piperazine, is similar in construction to centrophenoxine, and is similar in action to drugs like piracetam. Attentil was effectively used to treat dementia, especially Alzheimer's disease, in older patients. What is significant about Attentil is that the benefits of taking this drug would begin to show very soon, even within a few weeks of starting. As an example of the effectiveness of Fipexide, in a large study that took place in the mid 1980's, over 85 percent of patients who took Attentil showed significant improvement in brain function. In another study, researchers noted a 60% average increase in cognitive ability in elderly dementia patients after they took the drug. Attentil was taken off the market for two reasons: one reason was that there were newer, more effective drugs on the market, and it was simply outdated. The second reason was that adverse reactions to the drug had been reported in isolated cases. It was known to cause fevers in some patients who took it, and in other cases, was even linked to serious liver problems, including several cases of chemical hepatitis and liver failure. How does Attentil help the Brain Function? Attentil works by minimally increasing the levels of dopamine in the brain. Aside from the previously mentioned cognitive benefits, this leads to better coordination, improved immune system function, and increased levelheadedness. For more information on which modern nootropics contain ingredients similar to Attentil, check out our product review section.